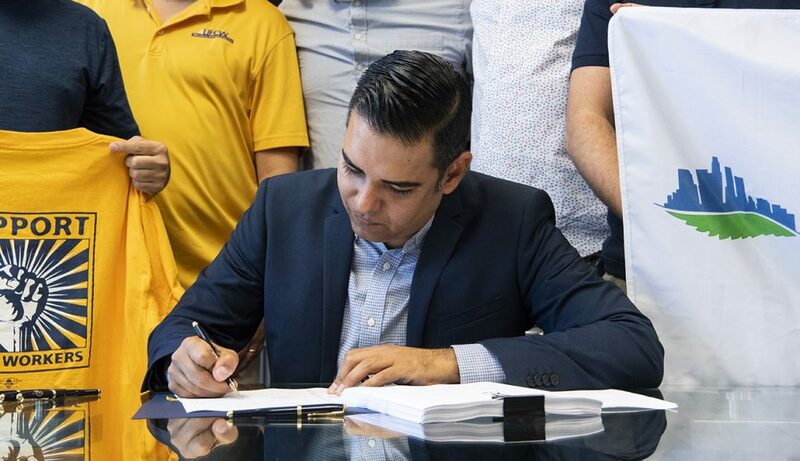 Mayor Robert Garcia officially signed into law Friday a law that will allow Long Beach dispensaries to apply for permits to sell recreational cannabis in the city as early as next month. Gathered on the 14th floor of City Hall with supporters and staff, Garcia inked the ordinance that had been in the works since 2017. California voters approved Proposition 64 with nearly 60 percent support in November 2016 which legalized recreational cannabis in the state but also reserved the rights of cities to continue to ban sales of it inside their boundaries. Until Friday Long Beach was one of those cities. Mayor Robert Garcia officially signed into law that will allow Long Beach dispensaries to apply for permits to sell recreational cannabis in the city as early as next month, at City Hall in Long Beach July 13, 2018. Photo by Thomas R. Cordova. Garcia’s signature closes a chapter in the cannabis regulatory history of Long Beach, which saw the industry and policymakers stumble through a decade in which the city initially allowed medical sales, banned them and then began deliberations to bring the industry back to the city before having the process commandeered by a ballot initiative. Politicians seemed intent to maintain their power over crafting the ordinance that would govern recreational sales in the city. The City Council voted to temporarily ban sales in November to allow time for the city attorney’s office to craft an ordinance that would work for the city and the council then moved quickly to adopt it. The council’s unanimous vote Tuesday night and Garcia’s signing of the ordinance today make Long Beach just one of a handful of cities in the region that allow recreational sales, including Los Angeles, Santa Ana and West Hollywood. Sales will be initially restricted to the existing nine medical cannabis dispensaries and will have to co-locate future sites with other medical dispensaries.